Unlock your children's potential by helping them build their strengths. This game-changing book shows us the extraordinary results of focusing on our children's strengths rather than always trying to correct their weaknesses. Most parents struggle with this shift because they suffer from a negativity bias, thanks to evolutionary development, giving them "strengths-blindness." By showing us how to throw the "strengths switch," Lea Waters demonstrates how we can not only help our children build resilience, optimism, and achievement but we can also help inoculate them against today's pandemic of depression and anxiety. As a strengths-based scientist for more than twenty years, ten of them spent focusing on strengths-based parenting, Waters has seen how this approach enhances self-esteem and energy in both children and teenagers. Yet more on the plus side: parents find it a particularly exciting and rewarding way to raise children. With many suggestions for specific ways to interact with your kids, Waters demonstrates how to discover strengths and talents in our children, how to use positive emotions as a resource, how to build strong brains, and even how to deal with problem behaviors and talk about difficult situations and emotions. As revolutionary yet simple as Mindset and Grit, The Strength Switch will show parents how a small shift can yield enormous results. "Waters comes off as a thoughtful parenting realist...supporting her ideas with a mix of parental anecdotes and pointers to psychological research." "As parents, we often obsess about fixing our children's weaknesses and neglect the importance of developing their strengths. This book is full of concrete ideas on how to change that." "Practical tips for parents from the wise and wonderful Lea Waters! So many parents, including me, struggle to translate scientific research into real-world strategies. This terrific book not only helps us understand ourselves and our children better but also makes that understanding actionable!" --Angela Duckworth, PhD, author of the New York Times bestseller Grit "The Strength Switch gives parents hope that they can build their children's creativity. By sharing parts of her own story of overcoming hardship, and presenting the latest science of positive psychology, Dr. Waters not only inspires parents to bring out the best in their children, but she inspires us all to be the best version of ourselves. A wise and warm book!" --Scott Barry Kaufman, PhD, co-author of Wired to Create: Unraveling the Mysteries of the Creative Mind "Lea Waters points to a needed shift in the way we are parenting our children and teenagers. 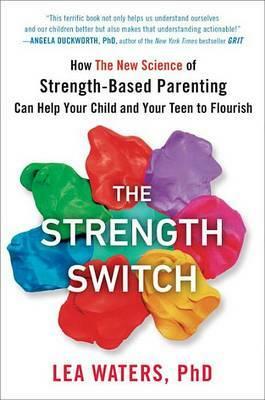 The Strength Switch rejects the current fad that drowns children in self-esteem and replaces it with research-based practices to help parents identify and develop their children's best qualities. Inspiring and timely." --Robert Biswas-Diener, PhD, author of The Upside of Your Dark Side "This book will help you do something groundbreaking for your children--shift your view to see their best and help them develop their unique strengths. Follow the wisdom here and you will bring deep, lasting benefit to not only your child but yourself. Thanks to Dr. Lea Waters, strengths-based parenting has arrived!" "Lea Waters's expertise, hope, and heart shine through the pages of The Strength Switch. She deftly draws on the science of positive emotions to help readers appreciate the vital role positivity plays in moving through hard times. This book will be a game-changer for unlocking your child's potential." Lea Waters, Ph.D., is President of the International Positive Psychology Association and the Gerry Higgins Chair in Positive Psychology at the University of Melbourne, Australia. She holds an affiliate position with Cambridge University's Well-being Institute (UK) and the Center for Positive Organizations at the University of Michigan (USA). Waters was the Founding Director of the Centre for Positive Psychology at the University of Melbourne and was listed in the Top 100 Women of Influence by The Australian Financial Review in 2015. She has also served as a consultant to a wide range of businesses. Waters lives in Melbourne, Australia, with her husband, Matthew Scholes; her son, Nicholas; and her daughter, Emily.